Some of the sweetest gifts come from the orchard. This collection of delights is no exception. It includes extraordinarily juicy Royal Verano® Pears and crisp, premium apples. Assorted gourmet snacks such as jumbo cashews, Crater Lake Crunch™ Trail Mix, and peanut butter pretzels complement the fruit, and it's all packed into a charmingly rustic wire basket with woven details. 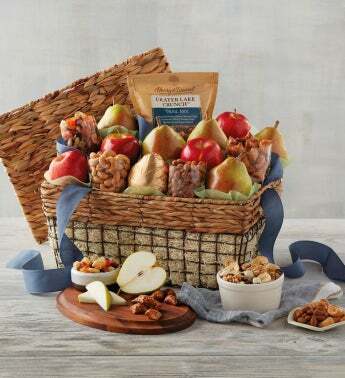 The basket will come in handy for décor or picnics out in the orchard for years to come.